This asana must be performed on an empty stomach. You must have your meals at least four to six hours before you practice yoga. You must also make sure that your bowels are empty. Do not practice this pose if you are currently experiencing headaches, insomnia, or high or low blood pressure. If you have a neck injury or current neck pain, do not turn your head upward in the pose. Instead, keep your gaze straight ahead with both sides of your neck evenly extended. Stand facing the long side of your mat with your feet about a leg’s distance apart. The heels in line with each other. Turn your right foot out so your toes are pointing to the short edge of the mat and turn your left toes in about 45 degrees. Exhale bend your right knee, thigh parallel to floor. Check that your knee is above the ankle in line with the first two toes. Ground the base of the big toe but roll the thigh out towards the little toe side of the foot. Take a deep inhale and firm your lower belly in and up. Exhale extend your body out over the right leg, then bring your right arm down, either with your elbow to your right thigh or place your hand on the floor outside of the right foot. Reach your left arm up to the ceiling, palm facing to the front. Press the outside of your left foot actively into the floor, roll your right buttock under slightly. Keep the spine long, neck long and in line with the spine, look straight ahead. Then roll your outer upper left arm toward your face and reach your arm over the head, next to the left ear, palm facing down. Extend from the outside of the left heel through the left fingertips. If your neck allows you can look up from underneath the left armpit to the ceiling. Revolve the ribcage up towards the ceiling. Press firmly through the feet, with the foundation stable, your spine can be light and your face soft. Hold this pose anywhere from 5 to 15 breaths. To come out of this pose: Press actively into your feet, and on an inhalation strongly extend through the left arm as you come back up to straight. Step your feet back to the front of the mat in Tadasana / Mountain Pose, or reverse the direction of your feet to do the same pose on the other side. Work on getting the foot and leg placement first. Build the pose from the ground up. Keep the outer edge of your back foot pressing firmly into the mat. Try to ensure your back baby toe is on the mat. Keep your front knee aligned with your front heel. Do not allow the knee to drift inward — this can strain the knee joint. Instead, imagine it slightly moving out toward the baby toe. Instead of bringing the fingertips to the floor, rest your forearm on your thigh (of the bent knee) or use a block outside the front foot to support your hand. Really press through both of the feet to make your foundation strong. If it’s difficult to keep your back heel on the floor, practice with your back heel against a wall. 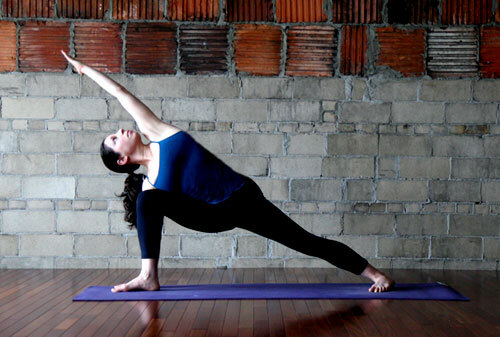 As you bend your front knee into the pose, imagine that you’re pressing the wall away from you with your heel. If your front fingertips don’t reach the floor, you can either rest your hand on a yoga block or bring your forearm to your front thigh. Be sure that your torso does not drop forward. Make the adjustment you need to keep your chest, hips, and legs aligned. If your hips are very tight, shorten your stance and straighten your front leg to a degree that is comfortable as you work on gaining flexibility. If your hips are very flexible, make sure your front shin stays vertical. Widen your stance as needed to make sure that your knee does not move forward past your ankle. It lengthens the side waist. Brings awareness to the side body. Utthita Parsvakonasana is an excellent standing pose to perform at or near the beginning of your standing pose sequence. It’s also a good preparation for wide-open groin poses, like Baddha Konasana, Malasana, and Bakasana.